Bottoms up! Oktoberfest Spins Jackpot is full of tasty pretzels, sausages, beer and wins! There’s a rewarding Progressive Jackpot & loads of bonus features! Good luck! 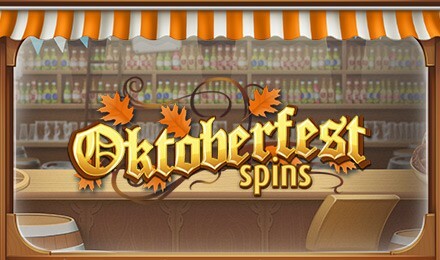 Oktoberfest Spins Jackpot Slots is packed with festive fun and exciting wins! The Beer Keg is your Wild, and can take place of other symbols to complete a winning line. All symbols except the Dog Bonus – when 2 appear in the centre of reels 1 and 5, your Picking Game with multiplied wins will begin! Oktoberfest Spins Jackpot also has a Free Refill Bonus, where you can get FREE Spins, and your Wild will become an Expanding Wild for extra wins!